Laguiole is a traditional form of cutlery and tableware produced in France. Dating to the 18th century, French shepherds and goat herders in the Massif Centrale section of central France created pocketknives with handles in the shape of a goat's hind leg. During the Napoleonic Wars, the men of this region were honored by Napoleon Bonaparte for their courage in battle by allowing them to include the emperor's royal bee on the back of the knife blade. After World War I, the knife was brought to Paris by men who found work as waiters and bartenders, and had a corkscrew added to their Laguiole. Starting in the 1960s, a number of artisanal cutlery producers started making Laguiole tableware and service sets. They became very popular, thanks to the high quality built into these handmade sets. 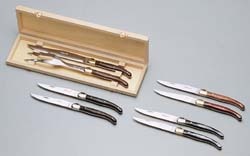 Today over thirty firms produce Laguiole pocketknives, cutlery, and tableware in France. Most of them are small firms that specialize in high end cutlery, with hand-forged blades and special materials used to sheath the handles. T.W. McGuire International has offered Laguiole corkscrews, cutlery sets and tableware for over twenty years. These make excellent sales promotion gifts and retail sales items. Besides carrying the very highest quality Laguiole from Claude Dozorme, which is all hand made, we also offer very affordable machine produced Laguiole that is perfect for promotional programs. Handles come in natural horn, synthetic mother of pearl, stainless steel, rosewood, tortoiseshell acrylic, iridescent resin and ABS, depending on what is needed. Blades run from 1.2 to 2.5 millimeter's thick, with the tang running the complete length of the handle. Packaging is offered in bulk, cardboard gift, or beechwood wooden gift boxes. 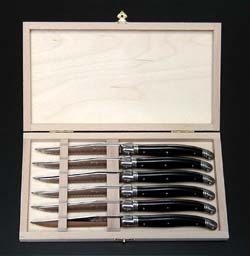 Laguiole is best known for its excellent steak knives, but offers many other items, including two and three piece carving sets, two piece salad service, foie gras and smoked salmon service, cheese knife sets, full five piece tableware sets, and much more. All are produced in France and meet that country's very stringent laws covering all items used for food service. You will find in our catalog a range of Laguiole products, from the most luxurious to the very affordable. Other Laguiole ware is also available, and should be requested if not found here.